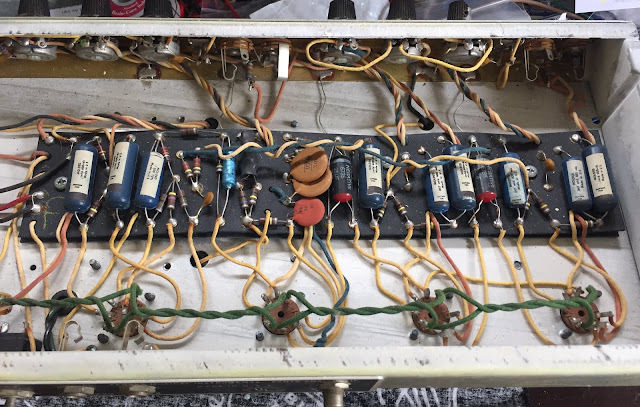 Spotted on Reverb.com, this "silverface" Fender Bandmaster was listed as a '70s model with a nasty hum across both channels, located just across the river in Yonkers, NY; I snagged it for $400 with local pickup. Having no idea exactly what circuit this was, or if anything had been altered in it's past, I was mentally prepared for every scenario; it appeared to have a "drip-edge" aluminum frame around the grill cloth, which could make it a '68-'69, and potentially a better circuit for my needs, but who knows what the guts looked like, or how bad that hum was. 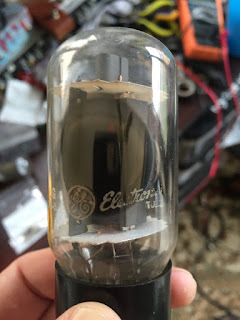 The next step was inspecting the guts, and after clearing off the dust & cobwebs, the first thing I noticed were the power tubes: GE 6L6GCs, likely original, meaning this amp may have never been worked on before. Carefully removing the chassis, I then noticed the tube chart: this was an AB763 circuit, same as the last run of original Leo Fender Bandmasters prior to CBS taking over, and along the same lines as the great "blackface" Deluxe Reverb, Showman, and Twin Reverb circuits (double-checked the actual circuit to confirm this, as incorrect tube charts were a big part of CBS-era Fender conversion). Filled with blue molded Ajax coupling capacitors and some odd Y-shaped Whale "Common Negative" electrolytics in the preamp cathode bias positions (my first encounter with either component in person), I was feeling pretty stoked; this amp was a nearly 50-year-old virgin, and I was about to pop it's dusty old cherry. The original circuit board, untouched by anyone other than spiders for nearly 50 years. Immediately after placing an order for all new electrolytic capacitors throughout the amp, I began testing the resistors and coupling caps with a volt meter, replacing those that had drifted out of spec (carefully placing all removed components in a plastic bag). I removed the old 2-prong power cord, along with the ground switch and "death" capacitor (if this cap fails in an old amp, your chassis can become voltage-hot. No bueno, el shocko! ), and replaced them with a modern 3-prong cable. I also began plotting some big changes at this point, including an expanded EQ and switchable Overdrive channel that could take this from stock Fender to fire-breathing tone machine (and back, if ever warranted). The two Dumbles I've gotten to know; note the left amp has a dual-concentric pot for Gain & Trim, as well as Master volume, whereas the other has no visible trim or Master. The Accent controls negative feedback (presence), and here it exists as a pot (left) and simple switch (right). I've been slightly obsessed with Alexander Dumble's designs for a little while now, mostly due to their arcane nature (who doesn't love a good mystery? ); the guy has made less than 300 known amps, mostly built to unique specs and customized for individual players, fetching ridiculous sums on the vintage market. I've had the opportunity to play thru two similar yet different Dumble Overdrive Specials (no two are exactly alike), and can only describe them as being the absolute best Fender-style amps I've ever heard in person, with an unreal harmonic-rich overdrive that sounds as great on 1 as on 10 (fine, I only had them up to 4 or 5, but you get the idea). They have crazy amounts of gain on tap, but in a very refined, controlled way that somehow feels like it's about to explode at any moment but never does. I also love the tone of his modded Ultraphonix Fenders; they're a little nastier, rougher around the edges, less under control from the examples I've heard. With this in mind, I began seeking information. Knowledge has a way of demystifying things, and his Fender-based schematics weren't that intimidating (save for lots of local feedback and some fancy switches), so after a successful Princeton Reverb rebuild, my eyes were set on playing around with some of his ideas. By no means am I attempting to copy or clone an exact circuit, just trying to find where some of the mojo might lie. Examining the Dumble links posted on Schematic Heaven, I noticed the 70's circuits were very similar to an AB763 Fender, sans tremolo, and comparing them to the Bandmaster layout, it made the most sense to sacrifice the farmost-right preamp stage of the Normal channel for the new Overdrive, while leaving the original Level pot in place but rewiring it to control the Vibrato preamp. This would keep all of my level/gain controls in one area on the faceplate, and all tone controls in another area. I sketched out the idea over the original layout (above), and waited for the parts to arrive. 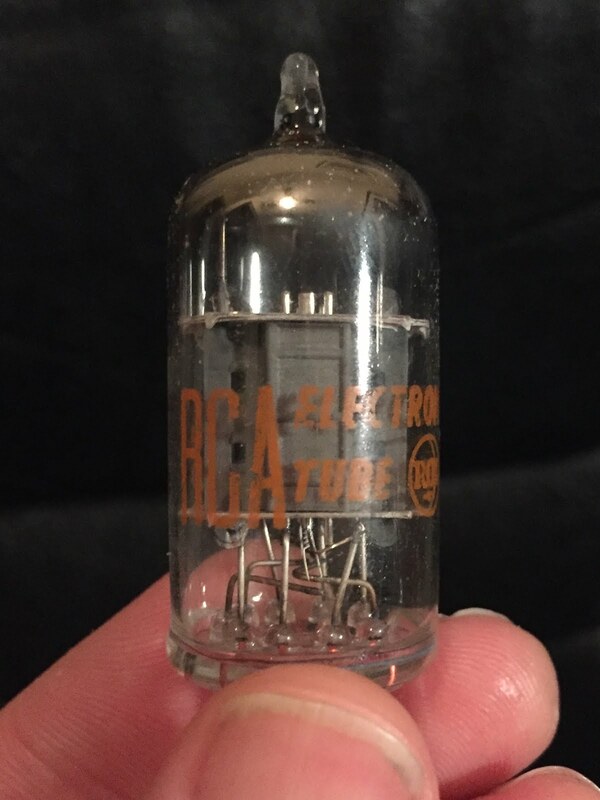 In the Dumble OD circuit, there are level controls before, between, and after the two triode stages of the 12AX7 tube, traditionally labeled Trim, Gain, and Ratio, plus the original Level control that feeds the clean preamp into these cascaded stages. These 4 pots allow endless ways to balance the gain of these circuits and combine preamp stages to suit an individual's playing style; the Trim control is sometimes internal or on the rear of original Dumbles, but I wanted the ability to experiment with it easily, as I believe it's the coolest unique feature of this design. Using the 2nd input for a DPDT "Overdrive" switch, and Duct tape for a labelmaker. For the tone stack, I added a Midrange control between the Treble and Bass, much like we did on the Princeton rebuild, but with a few slight component changes. Dumble used a larger 330pf capacitor to set the High-pass filter cutoff point slightly lower than a stock Fender; although I didn't have a 330pf silver mica capacitor on hand, I added a 120pf in parallel with a 250pf, giving me 370pf total on the Treble, and I love it! Gives the amp more teeth and bite than stock, can't imagine ever needing a Bright switch either. The new Mid control doesn't get quite as fat in this circuit as it did in my Princeton (where it was gradually bypassing the tone stack to ground), but has a narrower peak here that fits in very nicely just underneath our newly-sculpted Treble high-pass curve. The Bass is also much more effective and useful now compared to stock, incredibly tight sounding even at it's fullest range, and very interactive with the Mids. There is an optional "Boost" switch in the schematic that essentially cuts out the tone stack from the circuit like the Princeton's Mid control, allowing the full range of frequencies to pass thru like a Tweed amp; I tried this, but reversed it. Just not what I want from this amp, especially with the new EQ curves working so well. Having played around with the "Deep" and "Rock/Jazz" switches on those original Dumbles, I decided to omit them here for the time being; my EQ is permanently in "Rock" mode, and the Bass control gives me all the depth I could imagine needing for now. The 820-ohm negative feedback resistor was also swapped for a Dumble-spec 3.9k, with no accent control for now; I'm digging it like this. Also, like the Princeton, I doubled the ceramic disc capacitor values in the tremolo circuit from .01uF to .02uF to decrease the speed, but otherwise, that rest of it is stock. I may convert it from opto-sensor to tube bias at some point, but for now, I'm just happy it works. Filter cap board on underside of chassis; all new TADs and 2-watt resistors, with an original Mallory removed on right. Inspecting the Dumble schematics again, and paying close attention to the power filtering and voltages, I rebuilt the filter cap circuit with TAD electrolytics and resistor values per those Schematic Heaven files, and it worked a charm, with B+ voltages right on spec with those indicated. I firmly believe that THIS is the real Dumble secret, much more so than the preamp circuits; none of those would mean a damn thing without the tubes performing optimally, and his voltages seem to hit a real sweet spot in the electron vacuum. I'll be referencing these in future projects as well. 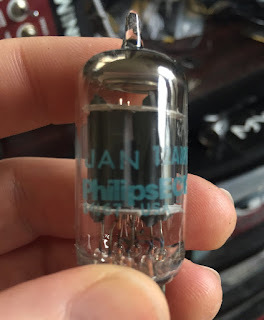 Speaking of tubes, I popped in a fresh set of JJ 6L6GCs, salvaged a lovely old RCA 7025 from the original set, and added a couple New-Old-Stock JAN/Phillips 12AX7WA (leftovers from a small going-out-of-business recording studio stash) to the preamp stages. I'm waiting on a matching JAN/Phillips 12AT7 for the phase inverter, and popped a current-production Electro-Harmonix in for now. May play around with a 12AY7 in the clean preamp stage (now V2), but the RCA is sounding really great; the JAN/Phillips has a great thick midrange in the OD stage (V1), and also for the tremolo (V3). It's fun to play around with these positions, as suggested by friend/amp guru Jamie Simpson of Booya! Amplifier Services. It's also popular to replace the Bandmaster output transformer with a beefier model, either from a larger Fender or aftermarket; Dumble did this in his Ultraphonix Fenders, and some do it for more headroom and tighter bass in stock Bandmasters. I'm holding off on this for now, as I'm not sure I'll be playing this amp loud enough to really appreciate it. If the gigs get larger and I find myself cranking this past halfway often, then I'll reconsider it, and likely go with an Allen Amps TO40. 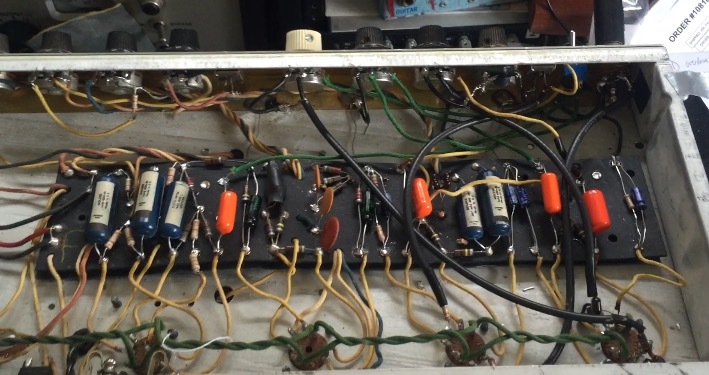 The completed circuit board, with Orange Drop capacitors used wherever an original Blue was replaced, Sprague or Nichicons on the cathode bias, and shielded cable used for most of the longer preamp stage runs. After double-checking my overdrive channel and DPDT switch wiring, I crossed my fingers, plugged in my Tele, and fired it up... and I'll be damned, it worked and sounded great! That 60 hertz hum magically disappeared with the filter cap changeout, and the overdrive sounded fantastic even at very low 1am volume, but I'd have to wait until the next morning to really have fun with it. As my exuberance in that brief video may tell you, I'm incredibly happy with the results, and would like to think I captured some of the magic by way of the cascading gain staging, EQ curves, and most importantly, new B+ voltages. Until I get a custom faceplate made up, this is how she looks, and I'll be cranking her up at the Randall's Island Spring Festival with J.D. Patch & the Hell Dwellers on May 6. Come hang! Removing the Fender logo was the final touch, along with a blue jewel on the lamp. Controls, from L to R: Input volume, Overdrive Gain, Ratio, & Trim, Treble, Middle, Bass, Tremolo Speed & Intensity. I'd love to see a schematic of your mods. If you check out those Schematic Heaven 70s Dumble circuits, i basically just implemented them into the Bandmaster as best as I could, without the extra switches or accent control. The AB763 mods were also very helpful.